Sen. Bernie Sanders of Vermont as he appeared on C-SPAN last Friday. How is it possible to kind of like a presidential candidate whose ideas would not work except to lead to ever more government control of everyone’s life? I don’t know, but I couldn’t help nodding now and then when I was flipping channels the other night and ended up with C-SPAN and Bernie Sanders at a campaign rally in South Carolina. He’s a self-described democratic socialist, but then again there’s not much of a difference any more between the democratic socialism of western Europe and government policies and programs in the United States. 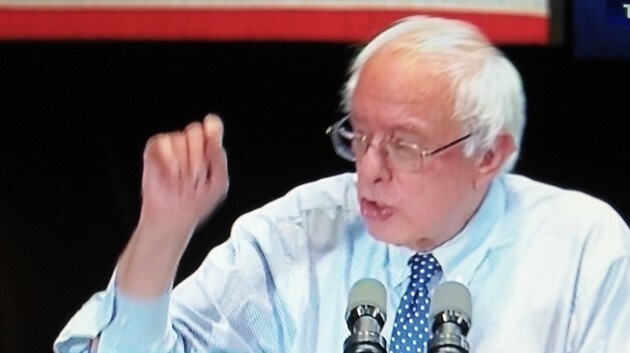 At that rally, Sanders, in shirt sleeves, worked up a sweat as he thundered against the super rich and called for all kinds of programs to benefit the average citizen, including universal health care for everyone under a goverment-run single-payer system, free college for everyone who wants to go, higher wages for working people, and expanded Social Security for people who left the work force behind. It all sounds delightful — if it could work — and it’s true that our-technology driven economy favors the few and leaves the masses behind. But it also sounds like what landed Greece in the shape it’s in. Sanders would tax the hell out of the rich to pay for all the free stuff he wants the government to provide. Somehow I doubt there are enough of those people, and that they would stick around to be hosed if Sanders got his wish. So no, he’s not the guy I would vote for. But among all the candidates, he comes across as a genuine character, not a bombastic phony like Trump or the calculated creation of political consultants and pollsters like some of the others in the running on either side. Sanders says what he believes, and believes what he says, and it’s been consistent since he was a young man, always on the liberal side or on the left. Consistency is a good thing, far better than being shifty, even if a man is consistently wrong. On election day Sanders will be 75, Hillary will be 69, and Biden will be two weeks shy of 74. In other words, the Medicare candidates. And do you remember when the Democrats gleefully created caricatures of Reagan and McCain as being dinosaurs? Now those same Dems are offended if anyone brings up the “age” issue. I suspect you will receive some negative feedback for doing so. Like the past, I doubt age will be a big issue come election time, especially if the Dem VP candidate is a generation or two younger. But if Clinton signs Bernie as VP, or drafts Biden for another go round, that could become a problem with many voters. Bernie tell us that the rich are buying the elections with their campaign contributions. As far as I can tell that amounts to something like what the ads for chips cost each year. What he does not say is that he is buying his election with our tax money, which amounts to astronomical sums, for his promised programs. He probably doesn’t realize it, but true democracy means that 51% take away the private property of the richer 49%, and that’s why we have a constitution to prevent it. We are a republic, not a democracy, thank god. It is difficult for me to get excited about anyone right now. Trump? Clinton 2.0? Bush 3.0? Sanders??? If ever the two party system has failed us, it is now. By the way, I do not understand the allure of free college education. We have a huge number of un(der)employed graduates right now. Do you think even more hypothetical graduates will help our economy? Basically, when most everyone has a degree, would an employer even ask about it? Additionally, a degree does not equate to intelligence or tolerance or aptitude. Do not misunderstand, there is a correlation between the two, but wouldn’t that break down under the weight of a mass degree program much like high school diplomas do not ensure basic, non-emoji literacy? I am willing to be persuaded to change my mind so please feel free to point out my fallacies. Some, if not most, of the increase in need for college is as a training ground for the benefit of employers, especially if you include community colleges. Besides that, I agree with you. Hasso, I echo your thoughts on Bernie Sanders having experienced the same intrigue you’ve expressed. I’ve said Bernie knows who and what he is. He’s genuine and believes in his message. Bernie recognizes the massive decline of the middle class and the ever increasing wealth gap we have today. He correctly identifies many of the forces that led us to this dangerous path, yet misses others, many of which he advocates for, involving ever more government control over our lives.Sander’s ideas would make capitalism unrecognizable beyond the “crony” variety that’s so pervasive today. And how would we pay for it all? By borrowing more money from China and future generations? If elected and allowed by Congress to put his ideas in place, Sanders might well finish the “fundamental transformation (destruction) of America” promised by Obama. Our nation was not built on the concept of massive income redistribution which is exactly what Sanders would attempt, openly. A Sanders presidency would be akin to electing Robin Hood. If Trump fails to win the GOP nomination and runs for the general election as an independent, he could easily deliver the presidency to the Democratic nominee by splitting the conservative vote. Because many Democrats would hold their nose closed and vote for a corrupt Hillary before voting for any GOP nominee, anything short of a criminal indictment will keep Hillary in the race. And what if Hillary is forced to abandon her run? A Bernie Sanders/Elizabeth Warren ticket?. Disturbing. Another guess: “what landed Greece in the shape it’s in” is mostly down to lying politicians, political corruption, and tax avoidance. Doesn’t mean I’m voting for Sanders, but I’m certainly tempted (after changing my affiliation from Libertarian to Dem). Even more tempting: a punk vote for Trump.